Set in an 18th-century Palladian mansion on 500 acres, Lucknam Park Hotel is only 10 miles from the city of Bath and the perfect retreat from the city. A true 5-star country estate, Lucknam Park not only delivers on luxury, it also hits that elusive mark that typical 5-star hotels don’t often reach. You can tell from the moment you drive up to the house that your expectations will be exceeded. When we pulled up outside the house, we were immediately impressed by the exterior of the mansion. It looked like a castle, with a stone exterior. We were even more impressed upon entering the cozy front room. There was a small desk where we checked in, but otherwise the front room felt like the entrance to a house, where we had been invited to spend the weekend. Another guest sat quietly reading a book. When booking a room at Lucknam Park, you have your choice of a number of different types of rooms, including a classic double room in the main house, a garden room in the courtyard, or one of the cottage rooms. We were staying in a Grand Suite room in the main house. Not having seen the other rooms, I can’t say with certainty, but I think a Grand Suite is definitely the way to go. It was opulent, with a four-poster bed, a separate sitting room and a large bathroom with heated floors and a gorgeous claw-tooth tub. We wouldn’t have ever left the room if the lounge wasn’t beckoning us for pre-dinner cocktails. As it was our first night in England, we didn’t know about the wonderful tradition of convening in the lounge an hour or so before your dinner reservation. We were more than happy to dress for dinner and make our way to the lounge. It was so thoroughly enjoyable to sit back on the plush couch and relax after a full day of sightseeing. Many of the other guests joined us, which made us feel like we were already fitting into this new pre-dinner routine. As our dinner reservation time approached, the waiter arrived with canapés and menus. He explained the options and gave us a moment to look it over. It wasn’t a difficult decision for us. It was our first meal in England, and we wanted to do it right, so we went with the gourmet menu with wine pairings. Another new custom we learned was that you put in your order there in the lounge, before being seated for dinner. The Park restaurant exudes elegance. You wouldn’t want to arrive there wearing jeans. Even if their dress code allows for “smart denim”, you will surely feel out of place. We were dressed nicely and almost felt out of place – perhaps because the room feel so much more grown up than we’ll ever be. Executive Chef, Hywel Jones, has held a Michelin star at The Park restaurant since 2006. His menu features organic, seasonal ingredients in innovative, modern dishes. The gourmet menu includes eight courses for £105. The gourmet menu with wine flight is £200. Each course is served with a 3 oz glass of wine. It isn’t often that a gourmet menu fascinates us the way it used to. Many of the dishes end up blurring together by the end and we realize days later that we can’t remember at all what we ate. But our meal at The Park was not one of those generic meals. I still remember each course, and that’s saying a lot due to the copious amount of wine they served it with. Here is a collage of the courses we had. The first course was a poached Cornish langoustine with an aligote. The second course was a roast Scottish diver scallop with a chablis. The third course as duck foie gras two ways with a Chassagne Montrachet. The fourth course was a braised fillet of Turbot with a Meursault Clos des Ambres. The fifth course was lamb two ways with a Bouchard Beaune 1er Cru de la Mousse. Then we had a selection of cheese from the cheese cart, which is always my favorite part of the meal. There were so many to choose from! It was served with a Vieilles Vignes. A pre-dessert popsicle was served as a palate cleanser. Finally, dessert was a vanilla crème brulee with Cremant de Bourgogne blanc NV Naudin-Ferrand with Crème de Cassis. We don’t usually stay for breakfast when we’re on the move, but we couldn’t pass up the chance to indulge in a big English breakfast, and it was a great way to fuel up in the morning without having to go out of our way. Prior to breakfast, a tray of tea was brought to our room for us to enjoy while getting ready and packing our stuff up. That was a very nice touch. Lucknam Park serves a full breakfast, made-to-order, in The Park restaurant. You can choose between the Continental or Full Menu option. We chose from the menu and were very impressed with the food. Scrambled eggs on toast with smoked salmon. I ordered the English breakfast (without eggs, because I can’t eat them), and Nick ordered scrambled eggs on toast with smoked salmon. Before we left Lucknam Park Hotel, we spent half an hour walking around the grounds. After visiting the spa facilities briefly, we were really bummed that we didn’t have more time to spend. The outdoor pool and spa area is really amazing. 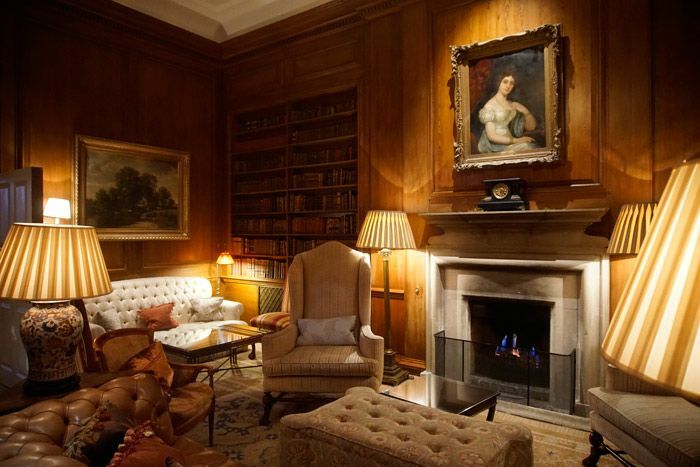 I would absolutely go back to Lucknam Park, and when I do, I’ll be staying at least a few days, if not a full week, in order to enjoy the other amenities they offer, as well as to spend some time walking around the property. It’s really a beautiful place. The staff was so welcoming and helpful. The room was not only gorgeous, but comfortable and luxurious. It’s exactly what you want from a remarkable 5-star hotel, plus that extra something we’re always looking for but rarely find. The Park restaurant is open Tuesday – Saturday from 6:30pm to 10pm and Sunday from 12:30pm to 2:30pm and 6:30pm – 10pm. Read reviews about Lucknam Park Hotel on TripAdvisor and check current prices. A big thank you to VisitBritain for hosting our stay at Lucknam Park Hotel. See all the coverage of our trip to the south west of England. (As always, all thoughts and opinions expressed in this post are my own honest reflection on our travel experiences). This entry was posted in Reviews and tagged hotels, South West England. I actually live about 15 mins from here and went for a birthday meal at the restaurant, lovely place! Oh man this place looks fabulous! Did you feel like a queen sleeping in that gorgeous bed? And how freakin beautiful does that scramble look on top of the salmon, fave breakfast right there. What should one wear if you were wearing fancy threads and still felt not right? I don’t think anyone cared an ounce what I was wearing, only I did! 🙂 The bed was so luxurious. Wouldn’t it be great to have that at home! Can’t believe you got to visit Lucknam Park! As a foodie living in the South West, it’s been on my wish list for ages! You’ll have to go, Lauren. You won’t be disappointed. The interior of the hotel looks so fancy!! The food looks delicious. I love places like this. So unique. The food looks amazing. I will make a note of this one (pinning it for later) Definitely worth a stop! I hope you’re able to check it out sometime soon. It’s great. Oh my goodness. That place looks incredible! And the food! Oh definitely. The food was incredible. That looks amazing, what an incredible spot. What luxury and elegance. It feels like something out of a Jane Austin novel. I want to go there! Oh, that’s a good description!